Bessie Bass's Battleship is fourth level of World 3 in Yoshi's Island DS, which acts as Bessie Bass's home. 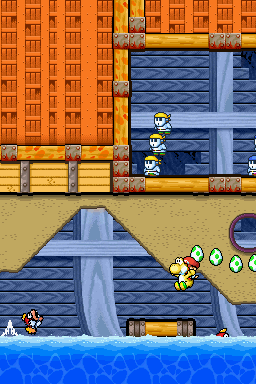 Yoshi starts the level on a ship filled with enemies, and must enter a Warp Pipe to appear in a Para-Koopa-infested area. Here, the player must locate a door which enables them to go inside an area with some enemies and a vase. Yoshi must break the vase to reveal a key and find another door which transports him to a Middle Ring and a pipe. It leads him back outside, where he must enter another pipe into a room with Tap-Taps and find a door leading to a room with Pirate Guys. Yoshi needs to locate a door and enter a room with Potted Ghosts where he must find another key and head back outside. The player needs to unlock a door leading them to a room with some Boos, and find a door there. This door takes the player to a Middle Ring, a Stork Stop, and a boss door which leads to Bessie Bass. The player can defeat her by hitting her when she leaps out of the water. Yoshi can then access the next level. This page was last edited on April 22, 2019, at 20:06.